Beautifully engraved SPECIMEN certificate from the CanUtilities Holdings Corporation. 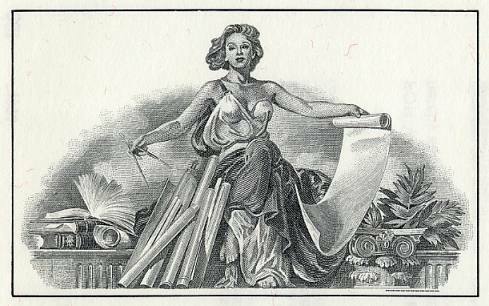 This historic document was printed by the B A Bank Note Company and has an ornate border with a vignette of a woman holding a compass and a scroll. This item has the printed signatures of the Company's President and Secretary. CanUtilities Holdings Ltd., was an indirect wholly-owned subsidiary of ATCO Ltd., was incorporated under the Alberta Companies Act and was continued under the Business Corporations Act (Alberta) on March 30, 1984. CanUtilities Holdings Ltd. The Articles of Incorporation restricted its activities to the holding of Class A non-voting and Class B common shares of Canadian Utilities Limited and certain activities incidental thereto, including the borrowing of funds from time to time for periods up to 90 days in an amount not exceeding the quarterly dividend requirement on the Series A, Series B and Series C Preferred Shares (Preferred Shares). 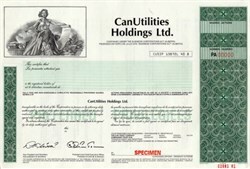 Additionally, the Articles of Incorporation permit CanUtilities Holdings Ltd. to receive and hold any non-cash dividends or assets (including shares of subsidiaries or affiliates of Canadian Utilities Limited) which may be issued or distributed by Canadian Utilities Limited to its shareholders.